Communicator, Institute of Scientific and Technical Communicators, Summer 2011. Since first writing with a computer nearly 25 years ago, I have used a variety of tools to craft thoughts into text: Impression Publisher, WordPerfect 5.1, Microsoft Word, QuarkXPress, Scribus, LibreOffice, Nexus Writer; I’ve even tried out LaTeX and FrameMaker. What all these programs have in common, however, is far greater than anything that sets them apart. Despite all the bells, whistles, ribbons and menus, the essential method of writing on a computer has barely changed from the first WYSIWYG programs of the 80s. That is until Scrivener came along. Scrivener is one of the very few text creation tools that approaches writing in a completely different way from those mentioned above. More important than merely being different, what makes Scrivener noteworthy is that it is designed around the way writers think, rather than the way computers work. Ever since their inception, word processors have forced us to write text by starting at the beginning and ending at the end. But back in the early 80s, when most people had never even heard the term ‘word processor’, Flower & Hayes (1981) made an influential case for thinking of composition as an iterative process that is far from linear. As we move through the stages of brainstorming, researching, drafting, editing and proofing, we do not do so in a neat, orderly fashion. Rather, we visit and revisit each of these stages multiple times throughout the creative process, jumping backwards and forwards at the whim of the text and our own cognitive processes. Since almost every writing task involves some kind of research, that also means we jump back and forth between reading, note-taking, highlighting, and drafting. In 1997, researchers at Rank Xerox (O’Hara and Sellen, 1997) pointed out that the standard desktop computer offered little support for the process writing approach. Ten years later, Microsoft researchers found that while technology had become faster and slicker, little had changed: computers and software applications still failed to support an iterative, process-writing workflow (Morris, Brush and Meyers, 2007). Scrivener changes all that. It may be difficult to say precisely what kind of program Scrivener is — it is part word processor, part outliner and part bibliographic repository — but very shortly after first using the program, it becomes clear that Scrivener approaches composition in a completely different way from the tools we’ve all been brought up with. Precisely how Scrivener is different we’ll get to shortly, but there’s always a few important things I want to know before hearing about how some piece of software is magically going to change my life, for example: how much time am I going to have to spend learning this new wonder tool before it starts adding to, rather than subtracting from, my productivity? And what about the costs? Few of us want to hear that it takes the resources of a medium-sized IT department to purchase and maintain it. In both respects, this program is a writer’s dream. Getting to grips with Scrivener is a cinch. The gentle learning curve is due in part to its familiarity – its basic functions will be familiar to anyone who has ever used a word processor – but more so to its exemplary Help and tutorials. These are not after-thoughts but have been carefully thought through from the beginning. Both a locally stored interactive tutorial and web-based video tutorials are available from the application Help menu, as well as a traditional PDF user manual. However, if you want to take quick and full advantage of the special things Scrivener has to offer then the interactive tutorial is the best place to start. It’s fast, clean and doesn’t stop you using the program while you’re using the tutorial or searching the Help. And the financial investment? A mere £35. On top of that, you can download the 30-day trial and give it a run before you decide to pay for the licence key, so it is not only within the budget of even the most cash-strapped freelancer but also risk-free to boot. As far as hardware requirements are concerned, it is worth noting that Scrivener was made for Mac OS X, and while a Windows version is in development (tentatively scheduled for later this year), this review applies only to the Mac version. Scrivener will run on either Power PC or Intel machines with anything from OS X 10.4 to the latest version of Snow Leopard (Update: Scrivener is now also available for both OS X Lion and Windows). The first and most obvious thing that you can do with Scrivener that you can’t do with an ordinary word processor is simultaneously read, mark-up, and take notes on a source document while you compose your draft. You can open your source document in one panel of Scrivener and make short notes on it in an adjacent one, or take longer, fuller notes in a new document within your project. Importantly, you can scroll the source document without deactivating the input window, meaning you do not have to interrupt your writing task to click between reading your source and inputting text into your draft. You can also search, annotate and highlight within the source document directly from within the Scrivener interface, and of course you can cut and paste from your source straight into your draft. Scrivener enables you to import webpages, email and most popular file types such as .pdf, .png, .rtf, .docx and many others. In Mac OS X, Scrivener works natively with Finder and Preview, so you get all the functionality of these built into Scrivener, including the use of Quickview, which can be contextually invoked by pressing the spacebar, and an array of other floating HUDs (Head-up displays). Drafting is what Scrivener is all about. Although it is not a single-sourcing program, Scrivener encourages you to write in small topic-based chunks and it could be ideal for drafting content that you might later move over to something like Madcap Flare or Adobe RoboHelp. Regardless of what software you use to put together your final content, the benefits of drafting in Scrivener come from its powerful outlining and organisational features, which centre around ‘the Binder’, the navigational panel on the left hand-side of the interface. In a Scrivener project, you can write in a single document in the main editor window, and then split the content into new documents with their own topic names using a simple hotkey call (you can also invoke the split command through the menu). You can keep splitting your documents wherever you want and as much as you want, and then reorganise them by dragging them into the preferred position in the Binder. Dropping one topic on top of another in the Binder, for example, makes the dropped topic a ‘child’ of the other. You can also give each document a synopsis and use the ‘Corkboard’ feature – a sort of pinboard of virtual index cards – to rearrange them in any order you like. If you want to see what your whole draft looks like as a combined project, click the View mode icon. No compiling is necessary at this stage and the view mode is instantaneous. If you’re not yet sure which arrangement of topics suits your project best, Scrivener’s ‘Collections’ feature allows you to collect all or some of your documents into different groups in any order you want. The ‘Collections’ function works in a similar way to ‘playlists’ in iTunes, organising items (in this case, documents in your project) in ordered lists according to different rules rather than physically moving or copying them from one location to another. The ‘Collections’ feature provides an interesting solution to solving topic organisation problems on long or complex projects. When you are finally finished drafting and organising, the ‘Compile’ command enables you to choose which elements in the Binder are finally exported (or printed) and which are not. You can choose to export some combinations of topics for one purpose and other combinations for another. Apart from various text formats, Scrivener also exports in HTML and PDF. 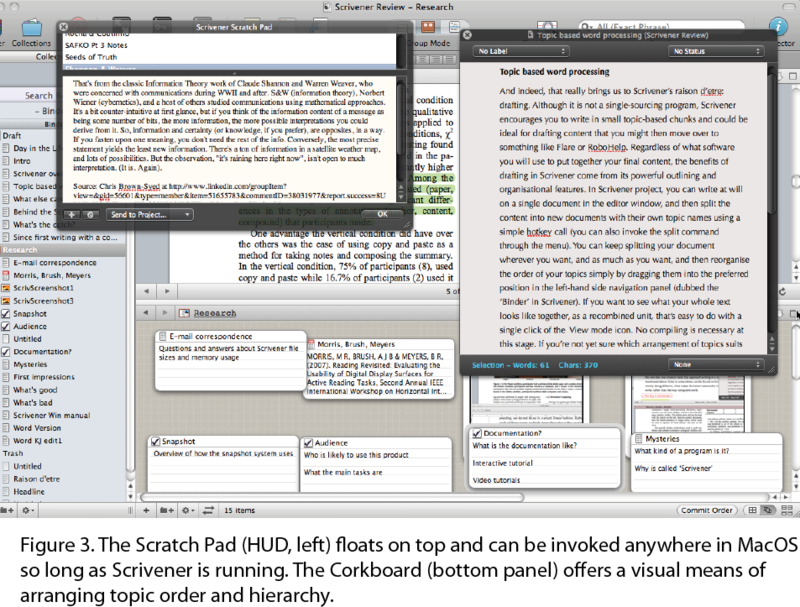 Scrivener has an array of powerful drafting tools that aid the writing task without disturbing your workflow. Snapshots is for all those authors who have ever realised that the draft they had two days previously was probably better than the one they’re staring at on the morning of the deadline. Personally, I’ve always found saving multiple document versions or using Word’s ‘Track changes’ feature to be visually confusing and complicated to use. Scrivener’s snapshot feature enables you to take a complete record of the state of any document with a simple command, to easily compare different versions, see the changes, or revert to a previous version in the Inspector. However, Snapshots is primarily intended to give authors the confidence to make radical changes to their work to see how they will work out, rather than to document every minor edit. Unlike version control software or content management systems, you are not asked to ’sign off’ changes, nor are changes recorded by author name. Essentially, Scrivener’s default assumption is that a project is the work of a single author, rather than a collaborative enterprise. Moreover, there is no automatic way to schedule a ‘snapshot’: it is a manual option that you must remember to invoke. In-line annotations are another useful feature if, like myself, you are the sort of writer who likes to make editorial notes in the text rather than out in the margins. You can automatically remove all your in-line annotations when you compile or export, so there is no need to run searches to delete them before you print. You can even make your in-line annotations appear as marginalised comments if you export your final draft to Microsoft Word. Alternatively, you can export your annotations as a separate .rtf file if, for example, you wanted to produce a report on how a project developed throughout the drafting process. The Scratch Pad and the Inspector are also features that can usefully aid the writing task. So long as Scrivener is running, the Scratch Pad can be invoked from anywhere within Mac OS X even when you are working within another program. So if some wondrous thought suddenly hits you while reading an email from a friend or browsing an article on the web, you can call up the Scratch Pad with a hotkey combination, jot down your thoughts and send them directly to your Scrivener project (or just leave them in the Scratch Pad to be read over later): perfect for those authorial gems that only occur when you least expect them. Perhaps more usefully, because the Scratch Pad is a floating HUD, it is ideal for taking notes while reading PDFs or other source documents outside of Scrivener and for drafting posts to blogs, discussion forums or social media sites. Scrivener’s Inspector is the place where all sorts of meta-data can be created, viewed and organised as well as where snapshots can be compared and edited. Comments, footnotes, tags, keywords, document status, synopses and much more can be recorded and accessed via the Inspector panel, which sits on the right- hand side of the interface. Visibility is easily toggled with the prominent ‘i’ icon in the top right of the toolbar or by hotkey. There is more to Scrivener than can be mentioned here, but as the program’s chief architect and company founder Keith Blount likes to point out, the beauty of Scrivener’s many features is that they intrude little in the writer’s workflow: none of the features force you to work in one way or another just to comply with the software architecture. And yet, just about any feature you might wish for in an authoring tool can be called up with a simple command. You can use the program as nothing more than a simple text editor if you wish, or you can create complex novels with character and location templates and targeted word counts for each topic in your section, chapter or book. Scrivener organises your work into ‘a project’, which contains all the documents you have created for that project as well as any files you have imported in the Binder. Although each project is saved with a .scriv file extension, one of the things I really like about this program is that it does not lock you into using Scrivener for the rest of your — or your data’s — life. A .scriv file is simply a Mac OS folder containing separate files, and importantly these are not stored in any proprietary file format. Documents created in Scrivener are all stored as .rtf files, and all imported files maintain their original extensions. This means that if anything goes wrong with Scrivener, there should be no problem retrieving your data. It also means that your work is portable. You can easily open, read, edit, copy and move anything you create without using Scrivener at all if you need or choose to. Because Scrivener integrates with and exploits a lot of native Mac OS processes, the program is fast to use and light on processor memory. The ‘spinning beach ball’ (the Mac OS equivalent to Windows’ egg timer) is rarely seen except during file import. Even graphics, once loaded into the Binder, are displayed quickly and effortlessly in the editor window. Inevitably every application has its limits, quirks and niggles. 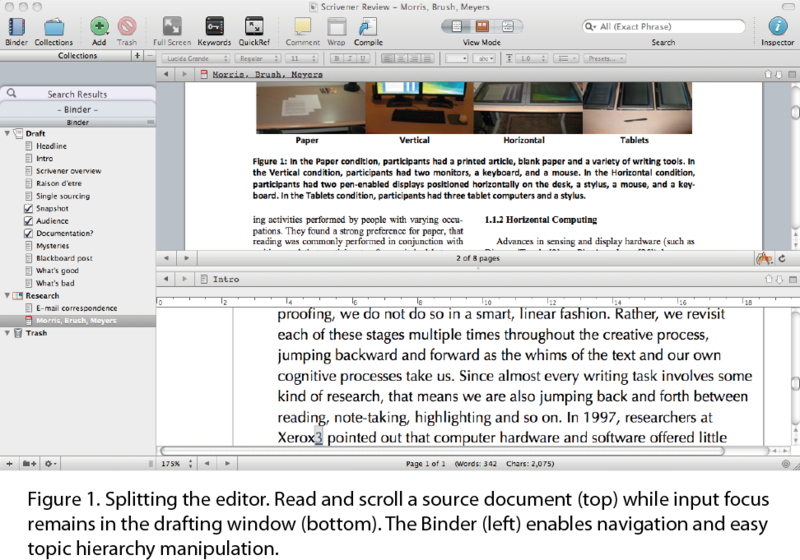 On the limitations front, the main problem is that Scrivener lacks much in the way of page layout tools. That’s not surprising given that its primary objective is to be a drafting tool, but it does mean you’re still going to need to open up Microsoft Word, QuarkXPress, InDesign or whatever else you normally use to produce your finished document. 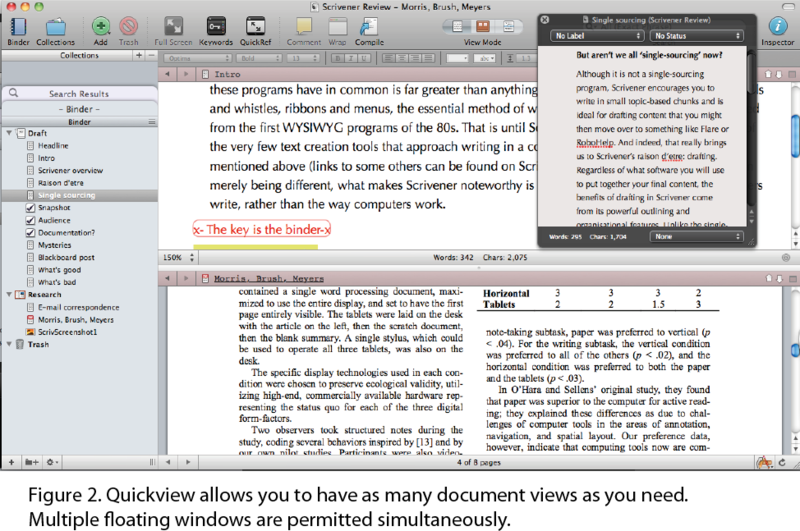 With that in mind, for some users, Scrivener’s writing tools may not offer much advantage over those of Word. Short documents or quick writing tasks can be done just as easily in your usual word processor. Scrivener best serves those embarking on writing long documents with complex structure, or writing tasks that require researching source material both before and during drafting. 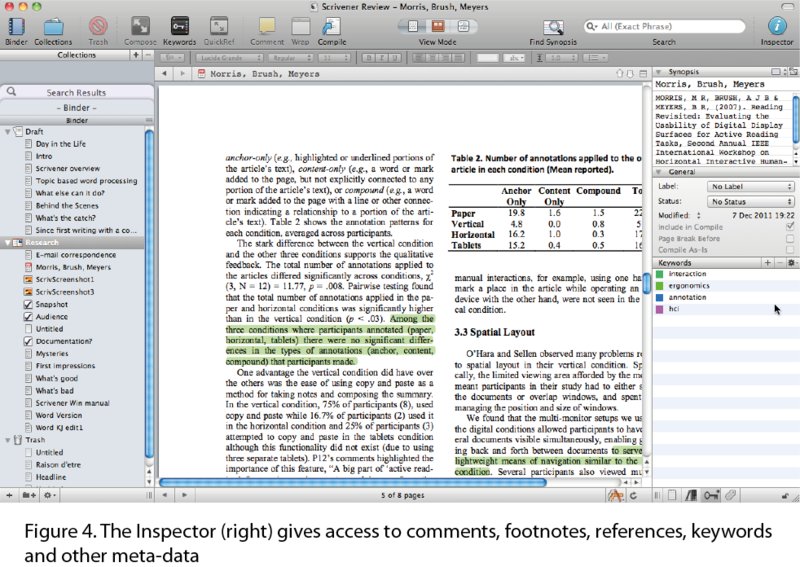 A second limitation of Scrivener is its support for graphics. Although there is no problem importing various graphic files and resizing them in the editor window, that is about the limit of Scrivener’s graphical capabilities. You are going to have to do any fine-tuning of graphics — run-arounds, opacity, borders, drop shadows and annotating or adding call outs — in another application. Moving on to the quirks and niggles, Mac users will find Scrivener’s trait of adding a new document when hitting return while a document is selected in the Binder — rather than performing the default Mac OS action of making the selected name editable — a frequent irritation. Even after several months of using the program, I find this continues to vex. Other things that could be improved are the provision of more buttons for common word-processing functions in the editor toolbar and improved consistency of controls for actions such as zooming: standard Mac OS swipe gestures can be used on imported documents, but Scrivener’s own text-editor window does not respond to these, and offers only the more traditional (and cumbersome) zoom menu with fixed percentage steps. Given the low price point and 30-day trial, this really is a program that anyone who writes anything of more than few hundred words should consider looking at. While primarily designed for authors composing long, multi- page documents, it is useful for any kind of writing task that requires researching and annotating material from several sources. Indeed, as a close look at the screenshots will show, I found it useful in just that way for composing this review. Flower, L and Hayes, J R (1981) ‘A cognitive process theory of writing’, College composition and communication, 365‐87. Morris, M R, Brush, A J B & Meyers, B R (2007) ‘Reading Revisited: Evaluating the Usability of Digital Display Surfaces for Active Reading Tasks’, Second Annual IEEE International Workshop on Horizontal Interactive Human- Computer Systems ( TABLETOP’07). O’Hara, K & Sellen, A, (1997). ‘A comparison of reading paper and on‐line documents’, Proceedings of the SIGCHI conference on Human factors in computing systems, 335‐42. Looking for some help with the Scrivener app. I am about 150,000 words into what has morphed from a short story into what looks like a short novel. I was using Iwriter on an iPad, which I liked, but on several occasions I lost work into thin air. i decided to look into Scrivener as I read that it had a really good self-saving component. And so many glowing reviews on it. The Scrivener tutorials are tough for me as i now have a Mac Air which makes my IPad look like a Model A. The tutorials seem to assume that the user is really good with computer, but as I missed the computer age because of my age, the combination of the Mac and Scrivener is over my pay grade. i have worked to learn this for a couple of months, and while trying to learn the Mac and Scrivener simultaneously i’ve gotten in over my head. But I can see what a cool app this would be if I could figure it. I found a young Apple whiz who whizzed through his tutoring way too fast for me to follow, and at his hourly rate I could see my retirement withering swiftly. I wonder if you might know someone in the Sun Valley, Idaho area who would be willing to help me out with this dilemma. Oh, yeah, I would love to make a donation if i could figure it out. oops–I meant : Using Scrivener + Dropbox together! Fair review. I’ve been using Scrivener on and off for a few years. I’ve decided to use Scrivener rather than Word for major writing projects (business non-fiction) and I’m seeing the benefit. Most of my time is spent gathering and organising the document which previously was not helped by Word at all. Now once gathered/organised, I find the document is magically “done” (almost). What a time saver! Wish it were not so difficult to export files to email…….. I was in the process of editing a novel about three months ago when I decided to try Scrivener. It seemed to be a useful tool, especially since Mountain Lion had crippled the scroll bar and made working with long documents so difficult, so I created sections and dumped into them the thirty-something chapters of my manuscript. I worked blissfully on each chapter, thankful for the ease of use. After a month, when I was about half-way through, a chapter I had just finished suddenly reverted back to the original text. When I checked the other chapters I found they had also. I went to Dropbox and got my latest save. To my consternation, when I booted it up it too had been reverted. I would have lost a months work had I not religiously saved each chapter back to Word as I finished them. I feel I can’t trust Scrivener, which saddens me, for the concept is one of the best I’ve seen for the writers of long manuscripts. If they ever get such bugs worked out and improve the word processor a bit, I’ll try it again. Yikes, what a terrifying story! Did you talk to Scrivener support about it? I’d be surprised if your work was actually lost; it should be lurking around wherever the snapshots are kept in the Scrivener project. If you haven’t contacted them yet, I’d suggest you do so. In any case, good luck and thanks for your comment. Having used Scrivener for almost two years, I continue to be impressed how whenever I think, “Gee I wonder if I can…” that I can. Or that I realize that something I’ve been doing in a convoluted way can be done easier in Scrivener. E.g., strange as it might seem, I just recently understood how/why it’s easier/more functional for me to use the Scratchpad than Stickies. In fact, for me, the hardest thing is to keep myself with playing around with really cool features that have little if anything to do with the way I write! Or to realize that certain features are good for certain projects…and maybe just for a while. For example, I had a side character who was terminally ill…and I needed to make that the “progression” of his illness continued to make sense as I reordered scenes. By simply adding a custom meta data field for “illness,” I can easily check this without scrolling the whole doc each time. At the same time, other projects have no need for meta data field…and I have to resist the temptation to create them because it’s so interesting to do so! Anyway, thanks for your piece.